StockMarketEye is a powerful, yet easy-to-use application for tracking your investments and following the changes in your favorite stocks. Its simple, elegant and intuitive interface saves you time when doing market and stock analysis, while its investor friendly tools give you the information you need to make informed investment decisions. In this section, you’ll discover the key features of StockMarketEye so that you can get started quickly. What is a Stock Chart? There are 3 main sections in the StockMarketEye window. Folders : The left side of the window is the folders section. It lists your portfolios and watchlists. When you click on one of the Portfolio or Watchlist names in the folders section, that folder will be displayed in the upper portion of the right side of the StockMarketEye window. Active Folder : The upper portion of the right side of the StockMarketEye window displays the active portfolio or watchlist. At the top of this area is a toolbar which allows you to switch between the various views (prices, fundamentals, reports) as well as buttons to quickly access often used features. Under the toolbar is the watchlist or portfolio itself, including the stocks, ETFs, funds, options and currency pairs that are part of this list. When you click on one of the items in the list, the chart for that item is displayed in the lower portion of the window. Chart Area : The lower portion of the right side of the StockMarketEye window displays the active chart. 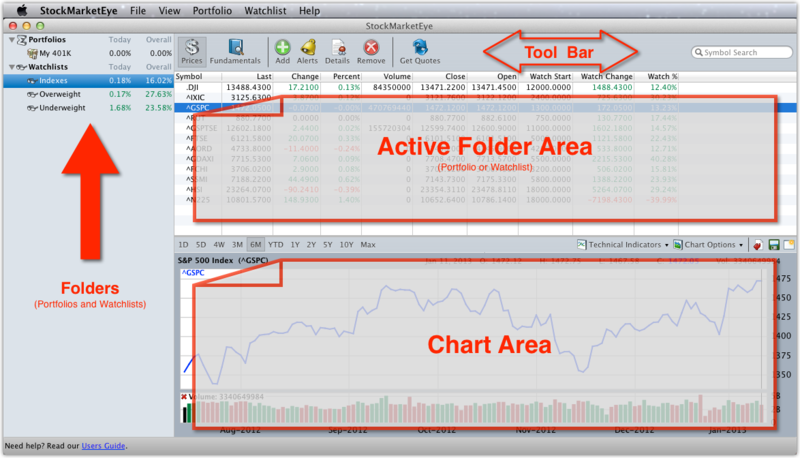 At the top of this area, just under the active folder area, is a toolbar where you can select the time range of the chart as well as menus for adding technical indicators and configuring the type of chart (line, candlestick, etc.). The first time you start StockMarketEye, 1 Portfolio and 3 Watchlists are automatically created for you. My 401k - A Portfolio to track the holdings of your 401(k). Indexes - A Watchlist of important market indexes. It has been pre-populated with the Dow Jones Industrial Average, the NASDAQ Composite, the S&P 500 Index, the Russell 2000 Index and a number of other indexes from major world exchanges. Overweight - An example Watchlist of stocks that you rate as “Overweight”. Underweight - An example Watchlist of stocks that you rate as “Underweight”. You may decide to keep these Portfolios and Watchlists, rename them or even delete them completely. A Portfolio is a collection of assets, similar to an account at a brokerage. In StockMarketEye, an asset is an investment in a stock, mutual fund, exchange traded fund (ETF), option or cash. Assets can also be non-quoted items such as bonds, preferred stock, property, etc, but the pricing of these assets must be entered manually. The value of each asset in a portfolio is determined by the asset’s current market price multiplied by the number of shares owned. The Portfolio’s value is the total of all of its asset values. Use Portfolios to track the performance of your investments. In addition to individual portfolio tracking, StockMarketEye provides a portfolio summary folder, accessible by clicking on the “Portfolios” item in the folders area. The portfolio summary shows you the totals of all your portfolios and investments. A sum total view is available to see the grand total of all your portfolios, while a combined portfolio view shows you the individual investments from all your portfolios, combined into one large portfolio. You can read more about Portfolios in the section Portfolios - Tracking Your Investments. A Watchlist is a collection of securities such as stocks, mutual funds, ETFs, options or currency pairs. Each security in a Watchlist has a starting “watch” price (“Watch Start”). This is the base-line price from which the Watchlist will track the price movement of the security. Use Watchlists to help keep your eye on the market. You can read more about Watchlists in the section Watchlists - Monitoring the Markets. A Stock Chart depicts the historical prices of a security. You can view a security’s chart by clicking on the security in your Watchlist or Portfolio. The historical price chart will then be displayed in the chart area. Use Stock Charts to gain perspective on market movement. More than one security can be displayed in the chart, allowing you to visually compare performance. Intraday quotes are available for 1-day and 5-day periods, while end-of-day charts are available for longer time periods. StockMarketEye’s charts can also display technical indicators such as EMA, Bollinger Bands, MACD, Stochastic and others. StockMarketEye even remembers how you have setup your charts to save you time next time you use StockMarketEye. Stock Alerts keep you informed of important activity in your watchlists and portfolios. You can quickly setup alerts for any item based on a broad range of factors including last price, volume, PE and more. Alerts are displayed visually within the StockMarketEye window as well as on your desktop through integration with Growl. Use Stock Alerts to be notified of important activity. Each Watchlist and Portfolio offers multiple “views” of your data to give you more perspective. Watchlists and Portfolios have a standard “Prices” view where you can see the current prices for the securities in which you are interested. They also have a “Fundamentals” view where you can get a quick look at some basic valuation information such as P/E, 52-Week High, and Dividend, among many others. Portfolios have a separate “Reports” view where you can see things such as the historical record of the activity (buys/sells/etc) that has take place in this portfolio and the gain/loss on your trades. You can also configure what data is displayed in each view. You’ll find more information on this topic in the Configuring Columns section. StockMarketEye uses stock symbols, also known as ticker symbols, to track securities in your watchlists and portfolios. If you already know the stock symbols for the securities you are interested in, you can enter them directly into StockMarketEye. StockMarketEye also provides a symbol lookup feature. You can type the name of the company or partial symbol into the “Symbols Search” box in the upper-right portion of the active folder area. The available stock symbols are displayed just below the search box. Double-clicking on one of the symbols will add the symbol to your watchlist or portfolio. Stock quotes are available from most major world exchanges, including the USA, Canada, UK, Australia, India, Singapore, France, Germany, and more. Each watchlist and portfolio is initially setup to automatically download quotes every 5 minutes. You can also download quotes for an individual watchlist or portfolio on-demand by clicking on the “Get Quotes” button in the toolbar. Quotes are available for stocks, ETFs, mutual funds, options and currency pairs through 2 data providers, Yahoo! Finance and Google Finance. Yahoo! Finance covers a broad range of securities from most major world stock markets. Quote data from Yahoo Finance is delayed, usually between 15-20 minutes. Google Finance covers fewer markets, but provides real-time quotes for US, Indian and Chinese markets as well as covering some securities that Yahoo! Finance does not (such as Canadian mutual funds). You can read more about stock quotes and stock symbols in the section Ticker Symbols and Data Providers.